(CNN) -- Rescue teams in New Zealand continued to search for survivors Wednesday after a powerful earthquake rocked downtown Christchurch, killing scores of people, toppling buildings and leaving others trapped beneath piles of concrete. At least 75 people have died, 55 of whom have been identified, according to Prime Minister John Key. Hundreds are still missing, Key told reporters at a news conference Wednesday afternoon. Among the missing are 10 Japanese students believed to be trapped under the rubble at King's Education College. Key also told reporters that he will urge the nation's parliament to declare a state of emergency for all of New Zealand. The 6.3-magnitude quake struck Christchurch during the lunchtime rush Tuesday. Frantic rescuers scrambled to reach those trapped beneath the rubble hours. Dazed, bleeding residents wandered through streets strewn with debris and piles of concrete. The quake toppled buildings onto buses, buckled streets, forced the collapse of a cathedral spire and cut power for most of the city. Rescuers worked overnight under floodlights pulling "a large number of people" from collapsed buildings, according to a police department statement posted online Wednesday. Twenty-two people, two of them seriously hurt, were pulled from the PPG building on Cambridge Terrace. Another 22 are still believed to be trapped in the rubble there. Meanwhile, eight people have been rescued from the CTV building, at Madras and Cashel streets, but "a large number are still unaccounted for," police said. "This is just heartbreaking," Key said during a trip to survey the damage. "This may be New Zealand's darkest day." U.S. President Barack Obama released a statement expressing his condolences for the victims of the New Zealand earthquake and offering to help. "Our thoughts and prayers are with all those whose lives have been touched by this tragedy. The United States is a close friend and partner of New Zealand," the president stated. "To assist in the rescue and recovery efforts, we have agreed to deploy a U.S. Agency for International Development Disaster Assistance Response Team, including an Urban Search and Rescue Team, and we stand ready to provide more assistance as needed." A U.S. congressional delegation was in the city for a joint U.S.-New Zealand conference hours before the quake struck. "Having experienced the warm reception of the people of Christchurch at the Partnership Forum only hours before the earthquake struck makes this disaster all the more personal and poignant," said Rep. Donald Manzullo, R-Illinois, chairman of the U.S. House Foreign Affairs Subcommittee on Asia and the Pacific. The U.S. delegation left Christchurch on Tuesday morning, less than three hours before the quake struck. 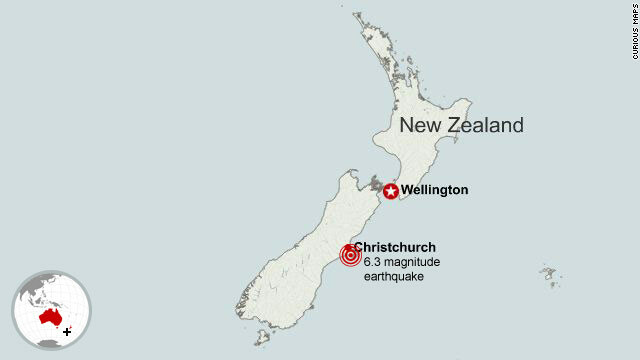 The initial quake, which struck Christchurch shortly before 1 p.m. Tuesday, was followed by a series of 33 aftershocks with magnitudes of 4 to 6, according to the New Zealand Ministry of Defense. A Japanese school said its students and teachers visiting the city were trapped under the rubble. Eleven students have been rescued so far, eight of whom remained hospitalized Wednesday and were receiving treatment, the school said. The trapped are communicating by mobile phone. The 21 students and two teachers were eating lunch when the earthquake struck, said Sayaka Kawai, an employee at the Toyama Foreign Language School. The school said it learned of the earthquake after one of the teachers sent a text message to her parents in Japan. The teacher, who was trapped, said she could see seven students around her but she could not account for the rest. A Japanese travel agency said it has been unable to contact some of its tourists who were in the city. Japan plans to send a rescue team to help with the efforts, according to authorities. Police, military and rescue crews have been dispatched from all over the country to help with rescue efforts, Key said. The quake ripped the facade of the iconic Christchurch Cathedral. At the Cathedral of the Blessed Sacrament, piles of stone sat atop crushed chairs on the floor as a light shone through a collapsed tower above the sanctuary. Southern New Zealand has been hit by a series of quakes since September 4, when a 7.1-magnitude temblor struck the area. The earthquake hit in the predawn hours, with the deserted streets helping keep injuries to a minimum. There were no deaths from that quake. The September quake struck deeper below ground and further away from Christchurch than Tuesday's temblor, and thus caused less damage despite the higher magnitude, officials said. Key said Wednesday that the September quake caused between $5 and $6 billion in damage in New Zealand dollars ($3.75 billion to $4.5 billion U.S.). According to an estimate released by J.P. Morgan Chase and Co., the Tuesday earthquake could cost insurers more than twice that amount. That would make the latest New Zealand temblor the world's most expensive natural disaster since Hurricane Ike struck the United States in 2008, causing nearly $20 billion (U.S.) in damage. The U.S. Geological Survey said Tuesday's earthquake was part of the "aftershock sequence" of the September earthquake. "It's a nightmare. A lot of people were just getting back on their feet after the original quake," said Kevin Fenaughty, data center manager for GNS Science, an earth-science research institute. Queen Elizabeth II said she was "utterly shocked" by news of another earthquake. "Please convey my deep sympathy to the families and friends of those who have been killed; my thoughts are with all those who have been affected by this dreadful event," she said in a message to Key. Key vowed that Christchurch will be rebuilt. "Christchurch, today is the day your comeback begins," Key said. "While nature has taken much from you, it cannot take your survivor spirit."